In the mood for some Beignets, but you can’t swing the trip to New Orleans to Cafe du Monde in the French Quarter? Here’s the next best thing. These are from one of my favorites from Southern Living made with Pillsbury Buttermilk Biscuits. They are a real treat and super easy. Give yourself 10 minutes and you can be sipping your coffee, eating your beignets and feeling as if are in the center of it all in NOLA. Everyone that I know that has visited New Orleans brags on the coffee and beignets at Cafe du Monde. I’ve been there once, but can’t say that I enjoyed the experience as I should have. Don’t get me wrong the beignets were melt in your mouth good, but it was a sweltering hot Labor Day weekend with the temperature 110 and the humidity to match. It was hard to enjoy much of anything except a good air conditioned room and some cold iced tea! Now you can make these anytime the mood strikes and they are as easy as pie! You will need yourself a dutch oven or a pan that is large enough to hold oil that is 2 inches deep with a couple of inches extra for cooking. I always like to use a candy/deep fat frying thermometer. I’m just not that good at estimating temperature. Attach the thermometer to the side of the pan. Heat oil to 350 degrees. Watch carefully while cooking because the temperature will most likely have to be adjusted. Mine got too hot very quickly while I was frying the beignets. I just pulled it off the heat for a couple of minutes. If you are lucky enough to cook with gas just quickly lower the heat. Be ready because this goes real fast. They literally cook about 1 minute on each side! Separate 1 (12 oz.) can Pillsbury golden layer biscuits. Cut each biscuit into quarters. Pour oil to a depth of 2 inches in a Dutch oven. Heat oil to 350 degrees. Fry biscuit quarters, in batches (I fried about 6-7 at the time) about 1 minute on each side. Be careful that the oil does not get higher than 350 degrees. If the oil is too hot they will cook too fast and the middle will be gooey. Same with a cooler oil temperature they will soak up the grease! Drain on paper towel and dust with a generous amount of powdered sugar. Serve immediately. Makes 4- 6 servings. this is definitely something i’ve done many times before, and if i can’t have authentic beignets, these are good enough to satisfy me! Oh, wow. 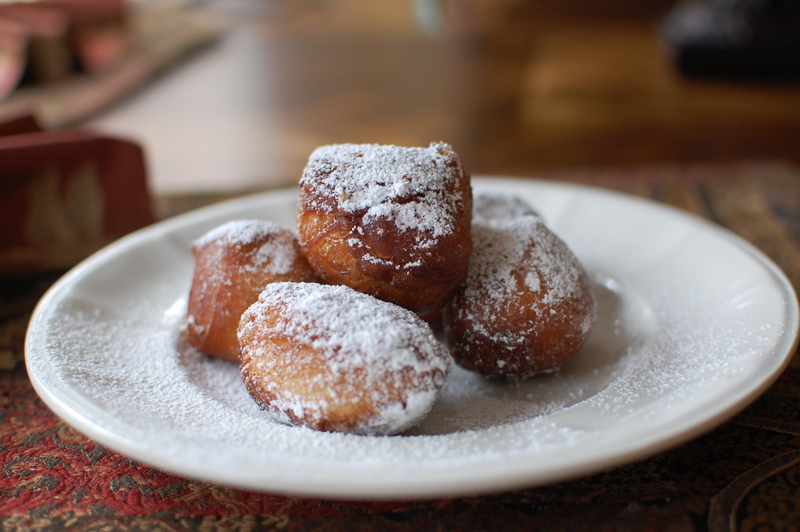 What a great way to have beignets when the mood strikes! These look incredible.